* Added Tablet & Mobile logo upload feature. * Updated site title typography (customize transport = auto). * Updated slider buttons background color (customize transport = auto). * Updated slider background overlay color (customize transport = auto). * Updated slider title styling (customize transport = auto). * Added Spanish translation files to theme language folder. * Fixed sidebar body typography issues. * Fixed footer widgets body typography issues. * Fixed slider button background color bug. * Added count blog posts views feature. * Added title tag to header top social icons. * Added frontpage boxes title & description typography feature. * Fixed particles not working bug. * Fixed Blog Tabs widget order by highest views bug. * Fixed bug (Can't use function return value in write context in class-agama-core.php on line 506). * Updated Agama widgets code. * Updated Small Thumbs blog layout template file. * Rewritten blog post meta feature in customizer (type = sortable). * Rewritten social share feature in customizer (type = sortable). * Added body text color feature (Customize->General->Body). * Added body text transform feature (Customize->General->Body). * Added headings text transform feature & transport = auto (Customize->General->Headings). * Added new file "framework/class-agama-header-video.php". * Completely rewritten header image & video code & separated sections. * Added new file "framework/agama-actions.php". * Added header top border color feature (Customize->Header->General). * Added page/post content background feature in Agama metabox. * Added Elementor to recommended plugins install. * Added Front Page Boxes Heading Typography feature (Customize->Front Page Boxes->General). * Added footer copyright text/link typography feature (Customize->Footer->General). * Added footer social icons color & hover color features (Customize->Footer->General). * Added WooCommerce single product sidebar on/off feature (Customize->WooCommerce->Single Products). * Updated all navigations typography with "text-transform" & "letter-spacing" features. * Updated "Pages Titles Font" transport = auto (Customize->General->Pages). * Updated header image particles circles color (transport = auto). * Updated header image particles lines color (transport = auto). * Updated OwlCarousel plugin to the latest version. * Fixed full width template issues when sidebar left position selected. * Fixed some bugs related to portfolio feature. * Fixed agama metabox uploaded images doesnt show in container. * Removed WPBakery Page Builder from bundled plugins (replaced with Elementor). * Removed NiceScroll feature (causing too many bugs). * Added header borders custom color feature. * Added multiple featured images for blog posts. * Added portfolio full width template. * Added portfolio shuffle icon feature. * Added multiple portfolio images feature. * Added portfolio image rollover icons display/hide feature. * Added portfolio image custom link url feature. * Added WooCommerce cart dropdown feature. * Minor portfolio styling updates. * Rewritten many parts of portfolio code. * Fixed portfolio custom page slug issues. * Fixed portfolio column 1 template issues. * Updated header top margin (transport = auto). * Updated header inner margin (transport = auto). * Updated header top border (transport = auto). * Updated header top border style (transport = auto). * Added shrinked logo font family feature. * Updated WooCommerce template files to latest version. * Updated navigation top font customization without page refresh (Customizer). * Updated navigation primary font customization without page refresh (Customizer). * Updated navigation mobile font customization without page refresh (Customizer). * Reverted back FontAwesome (4.7.0) bundle files into theme (Kirki prefetch has a delay). * Fixed disabling FontAwesome not working bug. * Added stop header (v2 & v3) shrinking feature. * Added header style feature into single posts / pages. * Added custom header image feature into single posts / pages. * Added custom header image particles feature into single posts / pages. * Added selective refresh feature for widgets customize. * Added crop featured images feature in blog general section. * Added show / hide email address feature on contact page template. * Fixed header image won't display on static blog page. * Minor changes to WooCommerce customizer options. * Reverted back pages titles on / off feature. * Reverted back single post titles on / off feature. * Removed FontAwesome from theme library (Kirki framework loads it). * Fixed breadcrumb enable / disable on home page issue (not static front page). * Fixed LinkedIn share post/page icon breaking code issue. * Fixed WooCommerce show single product via WPBakery Page Builder bug (opacity:0). * Fixed portfolio filter navigation float issue. * Updated NiceScroll jQuery plugin to the latest version. * Updated WooCommerce product images & thumbnails. * Updated WooCommerce shopping cart icon on media devices. * Updated WooCommerce single image & thumbnails code. * Updated bundled plugins to the latest versions. * Updated Vision Core plugin to not force activation. * Removed "Pages Titles" feature (now page titles are hidden automatically once breadcrumb is set to "On"). * Removed "Post Titles" feature (now post titles are hidden automatically once breadcrumb is set to "On"). * Removed vcSetAsTheme for WPBakery Page Builder. * Fixed blog grid layout isotope custom CSS issue on search page. * Fixed pagination on search page. * Fixed bugs on 404.php page when blog grid layout selected. * Fixed bugs on archive.php page when blog grid layout selected. * Fixed bugs on author.php page when blog grid layout selected. * Fixed bugs on tag.php page when blog grid layout selected. * Fixed "Warning: cannot redeclare function tgmpa." incompatibility with Popup by Supsystic plugin. * Improved Infinite scroll code. * Updated Agama slider, added alt attribute to images. * Updated Infinite scroll jQuery plugin to latest version. * Updated TGMPA plugin to newest version. * Updated bundled plugins to latest versions. * Added Partial Refresh feature to header area. * Added Partial Refresh feature to front page boxes. * Added Partial Refresh feature to breadcrumb area. * Added Partial Refresh feature to footer area. * Added Partial Refresh feature to contact page template. * Added Partial Refresh feature to back to top button. * Added contact page custom title feature. * Added contact page send message button custom text feature. * Added tabs icons to customizer. * Added front page boxes icon picker. * Fixed PHP Warning: A non-numeric value encountered class-agama-helper.php on line 178. * Updated Kiri framework to the latest version. * Updated many customizer options to partial refresh which will speed up setting changes. * Updated bundled plugins to the latest version. * Fixed header no background issue when using Layer or Revolution slider. * Fixed The The "add_to_cart_fragments" hook uses out of date data structures and function is deprecated since version 3.2.3. * Fixed NOTICE: WC_CART::GET_CART_URL IS DEPRECATED SINCE VERSION 2.5! * Fixed Notice: Kirki_Field::set_output was called incorrectly. "output" invalid format in field agama_pages_bg_color. * Fixed Notice: Kirki::add_field was called incorrectly. Do not use "alpha" as an argument in color controls. Use "choices[alpha]" instead. * Fixed header menu border bottom aligment. * Fixed back to top button to show up on mobile devices. * Fixed portfolio embed video not working. * Fixed front page boxes 5-8 bootstrap class issue. * Fixed date format to change on blog posts when date format is changed from Settings -> General. * Updated 404 not found page design. * Updated search form design. * Updated email social icon from "fa-email" to "fa-at". * Updated search box styling. * Updated TGM plugin activatioin to the latest stable version. * Updated theme tabs widget styling issues. * Added feature in Agama Options metabox - upload custom logo for single post/page. * Added Telegram messenger social icon feature. * Added footer background image feature into (Customizer->Footer->Styling). * Improved theme inline css loading speed. * Removed body background animate disable on pages option. * Fixed featured video embed not appearing on blog posts loop. * Fixed post video embed code cannot be deleted bug. * Updated post video embed option to show only on admin add/edit new post. * Optimized Google fonts loading. * Added embed videos on featured thumbnails area, on blog posts. * Added slider button style dropdown option. * Updated WPML wpml-config.xml file. * Updated jQuery imagesLoades plugin to latest version. * Updated jQuery Isotope to latest version. * Fixed blog grid layout overlap bug. * Fixed pagination on top of page (bug) when browsing category posts. * Added Agama slider disable loader feature. * Fixed enable/disable header search icon on header V1 style. * Fixed slider button not workin when particles enabled - bug. * Fixed breadcrumb not showing on pages/posts. * Fixed required plugins installation notice not showing. * Updated Vision Core bundled plugin to latest version. * Updated Visual Composer bundled plugin to latest version. * Added particles jquery feature in agama slider & header image. * Added Agama slider background overlay color feature. * Added SSL support for Agama slider images. * Added breadcrumb enable / disable for home page feature. * Fixed small bug (clear: both) for mobile menu. * Fixed post meta date separator missing on blog grid layout (single post). * Fixed contact page template "vision-row", "max-width" set to full width "100%". * Fixed contact page template heading responsivity on small media devices. * Fixed reCaptcha width issue on media devices. * Removed slide top content distance option (Instead set to automatic vertical center). * Removed enable slider on selected pages. (Slider can be enabled from Page -> Edit -> Agama Options metabox). * Rewritten header image code. * Rewritten Agama slider code. * Rewritten body background animation code. * Updated category posts pagination to match blog posts pagination. * Updated bundled plugins to newest versions. * Fixed transparent header mobile navigation top position bug. * Fixed slider title resizing only on first slide on mediia devices. * Fixed search form display bugs on Safari browser. * Fixed breadcrumb display bugs on Safari browser. * Fixed contact page reCaptch not showing bug. * Added custom page / post title for breadcrumb title bar. * Bug fixed, mobile menu icon not clickable when header image enabled. * Bug fixed, disabling breadcrumb & sidebar not working on static blog page. * Bug fixed, when using visual composer stretched row floating issue. * Bug fixed, when no any menu assigned and search icon is enabled in header (jQuery: Cannot read property 'addEventListener' of null). * Added enable/disable blog single post prev | next post navigation. * Added enable/disable featured thumbnails on single blog posts. * Fixed sidebar overflow issues on media screens. * Fixed blog grid layout left sidebar posts float bug. * Disabled blog posts animated for blog grid layout (too many conflicts). * Improved page content max-width issue. * Updated Revolution slider to latest version. * Updated Poland translations (Credit: Mariusz Szepietowski). * Fixed mobile menu WooCommerce cart icon not hidding when disabled. * Fixed top bar padding left/right on medium devices screens. * Fixed portfolio templates not loading portfolio items - bug. * Fixed header search when disabled jQuery error bug. * Improved theme loading speed by minifying main stylesheet file. * Added logo shrinked max-height feature in customizer. * Added header video height feature in customizer. * Added frontpage boxes animated feature. * Added blog posts animated feature. * Added new page attribute template "Blank Page". * Added LinkedIn icon share post/page feature. * Added footer widgets links color styling feature. * Added Poland translation files. (Credit: Mariusz Szepietowski). * Added page body styling features in customizer. * Added rich snippets feature (site-wide) to customizer. * Added breadcrumb height feature. * Added Pinterest share icon. * Added mobile navigation top menu on | off feature. * Added sidebar widgets headings customization feature. * Added sidebar widgets body text customization feature. * Added sidebar widgets links color styling feature. * Added sidebar widgets links hover color styling feature. * Added comments global on | off feature in customizer. * Added disable comments HTML usage suggestion feature. * Added footer widgets headings styling feature. * Added footer widgets body styling feature. * Added footer widgets body links hover color styling feature. * Added menus navigation icon picker. * Added development mode on | off feature in customizer. * Theme is now WPML compatible. * Registered theme translation strings for PolyLang plugin. * Fixed header image bug (display on homepage even if it's set to not display). * Fixed portfolio post_type slug bug. * Fixed Contact Form 7 input fields overflow on small screens. * Fixed Contact Form 7 submit button design issue (Applied "button button-3d" class). * Updated customizer logo max-height option (transport = postMessage). * Updated WooCommerce code to be compatible with WC 3.0. * Updated theme bundled plugins. * Updated calendar widget styling. * Improved navigations visual styling. * Rewritten search visual effect. * Minimized theme style.css file to improve theme loading performance. * Added top navigation typography & styling features in customizer. * Added page / post content padding feature in Agama Options meta box. * Added enable page / post title feature to Agama Options metabox. * Added header logo align option feature (left|center). * Added customizer social icons the phone number feature. * Added customizer footer typography features. * Added customizer custom jquery footer feature. * Fixed portfolio metabox options to display on vision_portfolio page. * Updated Vision Portfolio shortcode (added 4 new template styles). * Updated Vision Parallax Background shortcode (improved). * Updated body typography section (moved into General -> Body). * Updated customizer Site Identity section area. * Updated customizer header section area. * Updated customizer breadcrumb section area. * Updated customizer header image video section area (moved into Header -> Header Image section). * Updated customizer body animated background section (moved into General -> Body). * Updated customizer styling general section (moved into General panel -> Skins). * Updated customizer pre-loader section (moved into General -> Pre-loader). * Updated customizer headings typography & color sections (moved into General -> Headings). * Updated customizer additional css section (moved into General -> Additional CSS). * Updated customizer footer section area. * Updated customizer footer copyright option feature. * Removed Custom CSS feature & enabled WordPress Additional CSS feature. * Updated theme language translation files. * Fixed header V3 style, top navigation unhide option bug. * Fixed header V3 style, social icons unhide option bug. * Fixed infinite scroll load more button trigger bug. * Fixed frontpage boxes image size bug. * Fixed breadcrumb links font bug. * Added customizer frontpage boxes image option (transport = postMessage). * Added blog single post meta (on | off) feature. * Added enable single post/page social share icons metabox feature. * Added completely disable blog post meta feature. * Updated theme licensing, automatic updates, shortcodes, portfolio features are handled by Vision Core plugin. * Updated customizer blog options. * Updated primary color option (transport = postMessage). * Updated header logo color option (transport = postMessage). * Updated header logo hover color option (transport = postMessage). * Updated header navigation links color option (transport = postMessage). * Updated header navigation links hover color option (transport = postMessage). * Updated mobile navigation background color option (transport = postMessage). * Updated mobile navigation links color option (transport = postMessage). * Updated mobile navigation links hover color option (transport = postMessage). * Updated header background color option (transport = postMessage). * Updated header shrinked background color option (transport = postMessage). * Updated header background image option (transport = postMessage). * Updated header background image repeat option (transport = postMessage). * Updated header background image size option (transport = postMessage). * Updated header background image attachment option (transport = postMessage). * Updated header background image position option (transport = postMessage). * Updated breadcrumb background image option (transport = postMessage). * Updated breadcrumb background image repeat option (transport = postMessage). * Updated breadcrumb backgroun image size option (transport = postMessage). * Updated breadcrumb background image attachment option (transport = postMessage). * Updated breadcrumb background image position option (transport = postMessage). * Updated breadcrumb background color option (transport = postMessage). * Updated bredacrumb text color option (transport = postMessage). * Updated breadcrumb links color option (transport = postMessage). * Updated breadcrumb links hover color option (transport = postMessage). * Updated heading (H1) color option (transport = postMessage). * Updated heading (H2) color option (transport = postMessage). * Updated heading (H3) color option (transport = postMessage). * Updated heading (H4) color option (transport = postMessage). * Updated heading (H5) color option (transport = postMessage). * Updated heading (H6) color option (transport = postMessage). * Updated (footer) widget area background color option (transport = postMessage). * Updated (footer) copyright area background color option (transport = postMessage). * Fixed breadcrumb font family bug. * Fixed breadcrumb mini text/link color bug. * Fixed blog post meta bugs. * Fixed pinterest post share button bug. * Enabled Site Identity default WordPress feature in Customizer. * Removed Agama favicon feature and enabled default WordPress favicon feature under customizer Site Identity. * ADDED: Vision Core plugin. * ADDED: Bundled plugins automatic update feature. * ADDED: Portfolio page set custom page slug feature. * ADDED: Contact template map API key feature. * UPDATED: Rewritten code for admin metabox data saving process. * UPDATED: Rewritten code for comments area. * FIXED: Agama slider responsivity bug. * FIXED: Theme automatic update bug. * FIXED: Header background color transparency bug. * FIXED: Portfolio pagination bug. * FIXED: License details save bug. * FIXED: Do not show comments container wrapper when comments are disabled. * FIXED: WooCommerce products per page dropdown select bug. * ADDED: Agama Pro slider responsivity feature. * ADDED: Blog thumbnails hover effect on/off feature. * ADDED: Blog single posts titles on/off feature. * FIXED: Breadcrumb responsivity bug. * FIXED: Blog small thumbs layout issue. * FIXED: Shop page sidebar bug. From now If you remove all widgets from shop sidebar the shop page will be full-width. * UPDATED: Color box shortcode (added icon picker feature). * UPDATED: Counter box shortcode (added icon picker feature). * UPDATED: Icon box shortcode (added icon picker feature). * UPDATED: Alert box shortcode (added icon picker feature). * UPDATED: Theme language files. * UPDATED: WooCommerce template files. * UPDATED: Revolution slider plugin. * UPDATED: Layer slider plugin. * UPDATED: Visual Composer plugin. * ADDED: Mobile menu shopping cart icon. * ADDED: Mobile menu, top navigation is included in primary menu. * ADDED: Agama slider set time between each slide feature. * ADDED: Agama slider title font styling feature. * ADDED: Frontpage boxes +4 boxes more, total 8 boxes. * FIXED: Notice WP_Customize_Manager::remove_panel was called incorrectly issue. * FIXED: Tiny issues with header image. * FIXED: Body background animate bug. * FIXED: Agama slider content top distance bug. * IMPROVED: Header image & sliders are more friendly. * UPDATED: Dark sking styling. * ADDED: Default theme slider feature. * ADDED: Layout width customization feature. * ADDED: Logo max-height customization feature. * ADDED: Headings (h1, h2, h3, h4, h5, h6) font color customization feature. * FIXED: Header navigation large line-height on media devices. * FIXED: Disable body background animation on selected pages bug. * FIXED: Disable breadcrumb on selected pages bug. * FIXED: Warning fopen()... issue. * FIXED: Not working preloader bug. * FIXED: Mobile menu logo overlap. * FIXED: License details not saved bug. * FIXED: Pinterest post thumbnail image sharing. * FIXED: Undefined variable primary_color issue. * UPDATED: Corrected frontpage boxes default icons, titles & texts. * UPDATED: Bundled plugins to newest versions. * ADDED: Transparent header feature for Header V2. * ADDED: Portfolio enable / disable share icons feature. * ADDED: Breadcrumb link hover color feature. * ADDED: Theme update available administrator notices. * ADDED: Mobile navigation custom styling features. * FIXED: Testimonials shortcode when no author image hide image wrapper. * UPDATED: Mobile navigation completely restyled. * UPDATED: Theme options migrated into Customizer. * IMPROVED: Body background animation feature. * FIXED: Portfolio templates "invalid argument supplied for foreach" warning. * UPDATED: Disabled portfolio archive page. * FIXED: Header logo width 100% bug on media devices. * FIXED: Comments & comment form not displayed issue. * UPATED: Theme & theme shop responsive stylesheets. * ADDED: Automatic theme update feature. * UPDATED: Shop responsive stylesheets. * UPDATED: Translation language files. * FIXED: WooCommerce "product_categories" shortcode styling issue. * FIXED: Transparent header issue. * ADDED: Set header background image or color styling feature. * ADDED: Header borders color styling feature. * ADDED: Heahder links & links hover styling feature. * ADDED: Blog posts date enable/disable feature. * ADDED: Blog posts author enable/disable feature. * ADDED: Blog posts category enable/disable feature. * ADDED: Blog posts comments counting enable/disable feature. * ADDED: Breadcrumb font styling feature. * ADDED: Enable / disable fontawesome icons feature. * ADDED: Enable / disable sidebar for single posts & pages. * ADDED: French language translation files. * FIXED: Wrong mobile menu appear bug. * FIXED: Footer widget title border color bug. * FIXED: Header multiple images, no image broken url bug. * FIXED: Emails sending from contact page. * FIXED: Blog grid style on archive, tag, category pages. * FIXED: Sticky header & mobile menu issues. * FIXED: If sidebar is not active, page width will be automatically set to full-width. * UPDATED: Redesigned whole shop (WooCommerce) pages. * ADDED: Breadcrumb background image feature. * ADDED: Breadcrumb size feature. * FIXED: Links color change bug. * FIXED: Mobile navigation always open issue. * FIXED: Mobile navigation disable cart icon issue. * FIXED: List & bullet style font change bug. * FIXED: Share icons breaking url issue. * ADDED: Pages loading transition. * ADDED: Contact page template feature. * ADDED: Upload multiple header images which will be randomly shown on page refresh. * ADDED: Header image video aligment feature. * ADDED: Enable / Disable Read More buttons on frontpage boxes. * ADDED: Enable / Disable share box on pages & post feature. * ADDED: Portfolio shortcode in Visual Composer. * FIXED: bbPress forums errors & notices. * FIXED: Share box email icon on hover. * FIXED: Frontpage boxes visibility on blog page bug. * FIXED: RSS social icon disable bug. * FIXED: Recent comments widget icons overlap with text. * FIXED: Theme options translation issues. * IMPROVED: Bundled plugins update with 1 click. * ADDED: Contact form 7 styling support. * ADDED: Sidebar ( Enable / Disable ) feature. * ADDED: Sidebar position feature ( left /right ). * ADDED: Frontpage boxes icon type select from FontAwesome or custom image. * ADDED: Frontpage boxes custom image set width / height size. * ADDED: Enable lightbox for blog images feature. * ADDED: Enable / Disable tags on blog posts. * ADDED: Social share box feature. * ADDED: Header image video embed feature. * FIXED: Missing email icon on social icons. * FIXED: Tag template file issues. * IMPROVED: Dark skin stylesheet. * ADDED: Testimonials shortcode feature with 5 styles into VisualComposer. * ADDED: Header background image visibility (homepage/all pages) option feature. * ADDED: Header V3 enable / disable top navigation feature. * FIXED: Header V3 top search visibility issue. * ADDED: +1 new header style feature. * ADDED: Default header inner margin feature. * ADDED: Norwegian language translation files. * FIXED: Sticky menu assign checkbox visibility. * IMPROVED: Social icons style & animations. * FIXED: PHP fatal error on content-page.php file. * FIXED: Logo typography issues. * ADDED: Page title bar (Breadcrumb) feature. * ADDED: Enable / disable page title (breadcrumb) bar for invidual post / page. * ADDED: Alert message box shortcode feature in VisualComposer. * ADDED: Parallax shortcode feature in VisualComposer. * ADDED: Counter boxes shortcode feature in VisualComposer. * ADDED: Content icon boxes shortcode feature in VisualComposer. * ADDED: Few new features in portfolio metabox. * IMPROVED: Few things on WooCommerce shop pages. * FIXED: Typography headings color & size issues. * FIXED: Social icons tooltip bug. * FIXED: Few php warning bugs. * SYNCHRONIZED: Theme options with meta box options. * ADDED: Portfolio single page template. * ADDED: Portfolio customization options in theme panel. * ADDED: Portfolio pagination enable / disable feature. * UPDATED: FontAwesome fonts & stylesheet. * FIXED: Enable / disable background animation from single posts & pages. * FIXED: Enable / disable comments from single posts & pages. * FIXED: Enable / disable slider from single posts & pages. * IMPROVED: Infinite scroll, added auto or button triggered load of new posts. * IMPROVED: Restyled comments & comment form & buttons, also few other things. * IMPROVED: Optimized & minified jQuery code & plugins. * ADDED: Body background images animations feature. * ADDED: Custom CSS option. * ADDED: WooCommerce cart icon option in all headers. * ADDED: Search icon option in sticky header. * ADDED: Layout style (Boxed / Fullwidth) theme option. * ADDED: New options in posts/pages metaboxes. * ADDED: Google analytics option. * FIXED: WP_Widget is deprecated since version 4.3.0 notice. * IMPROVED: Agama Pro options with ReduX framework. * FIXED: Header overlap issues. * FIXED: Selecting slider issue in meta box. * ADDED: select left / right sidebar option. With Agama Pro theme you will get premium support on our forums which are locked for public access. Reliable & quick solutions for any issue. Agama PRO theme comes with lifetime updates feature. Update theme and bundled plugins with one click. No more stress with theme updates. We provide allot of video tutorials for Agama PRO theme via theme-vision YouTube channel. Learn how to use Agama PRO theme. Every element of Agama PRO theme can be translated to any language you want. Compatible with WPML and other plugins. Agama PRO comes with an SEO-ready structure, plus a clean and optimized source code. This basically means that Google will love your site. Optimized source code, compatibility with popular caching and minification plugins. Agama PRO gives you all. Fine-tuning your website has never been easier. With Agama PRO, you can customize the way your website looks, and see the changes in real time. Agama PRO theme is responsive on all media devices starting from desktop PC to all kinds of mobile phones and tablets. Stretch your website to the full width or make it boxed to surprise your visitors. Flexible layouts features. Are you looking for the perfect theme to build an online store ? 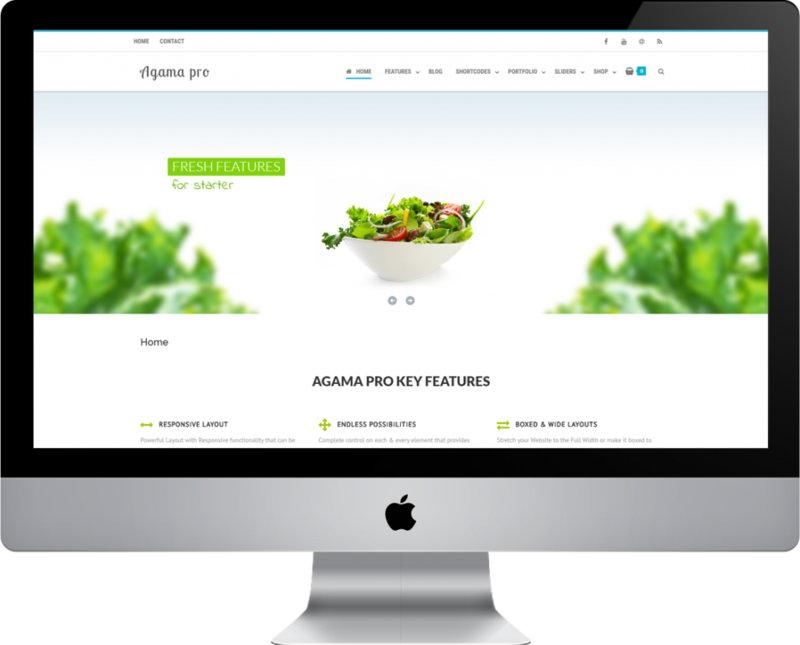 Agama Pro is the fastest and flexible WordPress theme that is intuitive and offers deeper integration with WooCommerce. With unique features and countless customizations you can build a store that matches your brand.